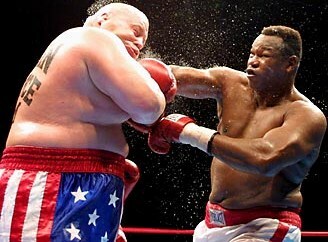 The Night “Butterbean” Dropped Larry “The Easton Assassin” Holmes! It was on July 27, 2002, when former world heavyweight champion Larry “The Easton Assassin” Holmes, 68-8 (44), was looking for a final “patsy” to end his career with. Holmes was known for “picking his opponents” to give himself an edge. Holmes “chose” a 334 pound “entertainer” who many felt was a “novelty act” in Eric “Butterbean“ Esch, 65-2-3 (48), from Jasper, Alabama, known as the “champion of the 4 rounder’s!” Only in his second and third fights did Esch have a pair of scheduled 6 round bouts and only stopped once in his career up until then. To give Holmes even more than an edge he demanded the bout be scheduled for 10 rounds. It’s no secret he was figuring Esch tiring if he even got to the sixth round. The first round had Holmes moving as much as he could at 254 pounds and using his jab 90% of the time. Holmes had a 3” reach and a 3 ½” advantage in height. Only when they got into a clinch did Esch hit Holmes with a right hand to the side of the head of Holmes. In the second round Esch backed himself into a corner and challenged Holmes to come in and fight him there. Holmes came in and backed up that fast while Esch came out of the corner laughing. In the third round the big punch of the round was a right from Holmes to the chin of Esch who “acknowledged” it was a good punch. In the fourth round Holmes did his usual “dirty trick” using his (football) straight arm left pushing Esch from the side of his head moving him a step or two to his left. Holmes got a warning from referee Chris Wollesen. Something Holmes had gotten away with his whole career and he let the referee know he didn’t like the warning. In the fifth round when Esch would bull his way in Holmes would immediately tie him up with arms around his upper body. Esch would drive his right hand into the rib cage of Holmes some six times. At the end of the round Holmes looked confused and walked in a circle before returning to his corner. This was the first round Esch seemed to win. In the sixth round Esch received a small cut on the outside of his left eye that never became a factor in the fight. In the seventh round Esch backed Holmes into a corner but Holmes quickly moved away and Esch “mocked” him for doing it. In the eighth round Esch landed his first left hook to the head of Holmes. He used a jab and right hands when he got close enough up until this point. Esch would bum rush Holmes starting with a right to the head and Holmes once again would evade Esch. This was the second round Esch took. In between rounds the camera focused on Holmes who seemed to be huffing and puffing with some swelling around his eyes. In the ninth round Holmes was warned again having his stiff arm glove on Esch’s chin “lining him up” for the right. Once again Holmes showed his arrogance back talking to the referee. Prior to the start to the tenth and final round Esch was standing in his corner while Holmes was slouched on his stool not moving until the bell sounded to start the round. At this point he had to be embarrassed that his idea of pounding on Esch the way he did Tex Cobb hadn’t worked. Esch would again dare Holmes to come into the corner where Esch backed himself into. When Holmes came in Esch rocked him with a right to the side of the head forcing Holmes to once again back up several steps. This was not the same Holmes who bounced in the ring for he was more flat footed from the start. With approximately 0:25 left in the bout Esch landed a right to the kidney of Holmes. With less than 0:20 left in the bout Holmes threw a right hand landing on the chin of Esch who countered with a left hook to the body knocking Holmes into a corner and halfway through the ropes. The ruling is if you are saved from a knockdown by the ropes it is an official knockdown. Holmes was shaking his head in disgust by the referee’s call and count with about 0:16 left in the bout. After Holmes took an eight count Esch came in from a neutral corner but before he and Holmes could do anything the bell sounded the end of the fight. Esch seemed to want to congratulate Holmes but the latter turned his back to Esch. The fans were cheering as Esch was walking around the ring with his hands held high as in victory. Holmes on the other hand was leaning on the ropes facing the fans in obvious exhaustion. For Esch it was a victory in itself going ten rounds for the first time. Then came the decision of judge Vaughn LaPrade of 97-92, judge Phil Kornberg 98-91 and finally judge Peggy McCuen of 96-93 as did this writer score it all for Holmes. For the 52 year old Holmes it would be his final time in the ring. For the 35 year old Esch he would fight on for another eleven years following this bout with a draw and winning seven of his next eight fights. Like most boxers they seem to pick up a majority of their losses at the end of their careers Esch went 4-6 in his last 10 bouts before retiring in 2013. Mark Holmes “Living in the Shadow” But Good Enough on His Own! Too many times when a boxer has an older brother or even a father like “Smokin Joe” and Marvis Frazier the one who “Lives in the Shadow” could be good enough to make it on their own. That was the career Mark Holmes had following in his brother Larry’s shadow, who was the world heavyweight champion! Mark finished with a 38-1 record with 17 knockouts. Mark Holmes did well in the amateurs winning the 1977 PA Golden Gloves at #147 and turned professional in July of 1980 when the USA was boycotted by then President Carter. Between July and November Holmes won all of his 5 fights. He made his debut in Bloomington, MN, when his brother defended his WBC against Scott Le Doux. In Mark’s sixth fight he defeated Randy Rivers, 5-1-2 on the undercard of Holmes and Ali. In Mark’s sixth fight came the future IBF light middleweight champion Buster Drayton, 8-1-1, of Philadelphia in Atlantic City, NJ, with Holmes taking a decision win. “I thought it should have been a draw,” said Drayton. In his ninth fight he knocked out Kenny Hodges, 5-1-2, on the Holmes and Berbick card. In 1981 Holmes went 11-0 in such places as Las Vegas, Scranton, Atlantic City, Cleveland and Detroit. He was offered a chance in May of that year by this writer to appear in an exhibition because I knew I couldn’t afford to pay him what he was making he said “I’d love to. I haven’t fought in Easton yet.” This was on the show I was promoting at Easton H.S. with 10% of the profits going to St. Anthony’s where both Larry and Mark boxed as amateurs. Being told by Mark I’d have to get permission from his manager, Larry I did just that. I was told by Larry “I ain’t putting my brother on some rinky dink show!” Shame because it would take 6 years and the “last fight” of his career in August of 1987 for him to appear for the first and only time in Easton. Though Mark fought 9 times in Pennsylvania it was only once in Easton. He fought in Scranton 4 times, Bethlehem 3, Allentown 1 and Easton 1. His brother fought in Scranton 8 time of which 5 were at the start of his career. Mark fought in Nevada 15 times. He fought on the undercard of 8 times. In Mark’s twentieth fight in the main event he stopped Mike Baker, 42-16-1, in Las Vegas. Less than 3 weeks later he fought on the undercard of Holmes and Cooney defeating William Page. In July of 1982 he had a second fight with Fred Reed whom he had decisioned 11 months previously knocking him out in Madison Square Garden it being his only time he fought in New York. In November of 1983 Mark stopped Henry Walker, 19-22-1, on the undercard of Holmes and Frazier and I don’t mean “Smokin” Joe. His brother may have counted that as a title defense but Marvis was 10-0 and not rated against the 44-0 champion. In 1984 Mark only fought 3 times but in 2 of them he stopped rick Noggle, 15-5, in Canton, OH, and defeated Odell Hadley, 13-3-1, on the undercard of Holmes and Bonecrusher Smith. In March of 1985 he defeated Cecil Pettigrew, 20-7-1, on the Holmes and David Bey undercard. In August of 1985 Mark had his biggest fight against USBA middleweight champion John Collins, 32-1-1, with 28 knockouts while Mark was 32-0. It was held in Scranton, over NBC Sportsworld. Collins had defeated former champion Oscar “Shotgun” Albarado, 57-11-1, Bill Bradley, 16-1, Teddy Mann, 26-9, Lenny LaPaglia, 19-0, Ken Whetstone, 22-1 and two fights prior to meeting Mark he drew with contender Alex Ramos, 21-2-1. So Collins came in with a very good resume. He was taller and had the reach on Mark. In the corner for Collins was well known trainer Carmen Graziano and the best cut-man in the business Philly’s Eddie Aliano. In the corner of Holmes was his trainer and his brother Floyd, along with another great cut-man from Philly in Milt Bailey. In the first round Collins came across the ring throwing a right hand trying to catch Mark right away. Collins was throwing the harder punches while Mark used his jab well and landing a solid right to the right cheek of Collins with about 15 seconds to go in the first round causing an abrasion under his right eye. In the second round Collins came out more aggressively landing a hard right to the jaw over the jab of Mark and down he went. It was doubtful he ever regained himself after that first knockdown. Collins would go right after Mark landing 4 punches and throwing Mark to the canvas that referee Frank Cappuccino ruled a slip. Collins was right on him landing a two-punch combination and a right on the way down of Mark. Cappuccino immediately and wisely waved the fight off at 2:05 of the second round. Collins was asked by Ferdie Pacheco if Collins thought the first knockdown punch would land that cleanly? No I didn’t think it would land that cleanly but I am glad it did. He had a good jab. He was quick you know,” said Collins. Pacheco asked why he was standing right in front of a puncher, “my jab was working good in the second round but I just got caught. I feel I will go back to the gym and work harder,” said Mark. His brother said “I know he’s a better boxer than Collins but he has to be more disciplined. Mark would return 13 months later at Stabler Arena in Bethlehem defeating Doug Mallett, 9-2. A month later back at Stabler he stopped Brian Porreca, 6-1. Several month later he defeated Philly’s Ernest Jackson, 13-7-1 the end of 1986. He would win his last 3 fights over 3 months starting in Jacksonville, and Ft. Myers, FL, before having his final fight in Easton defeating Jerome Kelly, 8-4-3. Mark was 28 years of age upon retiring from the ring. This writer will be nominating Mark for the PA BHOF with inductees being known in February of 2017. The following is the Boxing Insider notebook for the week of April 12th to April 19th, covering the comings and goings in the sport of boxing that you might have missed. Bob Arum recently told TMZ Sports that a rematch with Floyd Mayweather is “more likely than not” but says that there are serious obstacles to overcome. 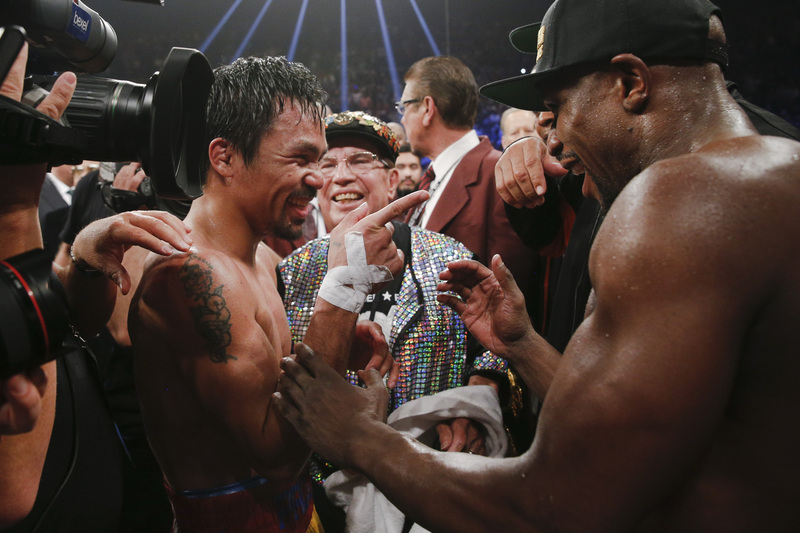 Arum also stated he knows Showtime has serious interest in Mayweather vs. Pacquiao II. Senator John McCain is set to join famous boxers and mma fighters such as Larry Holmes, Daniel Jacobs, and MMA fighters from Bellator MMA to show support of professional fighters study at Cleveland Clinic Lou Ruvo Center for Braind Health. This is to occur on Tuesday, April 26th at 12:15pm at the Armed Services Hearing Room at the US Senate in Washington D.C.
Dr. Charles Bernick, an associate medical director of Cleveland Clinic Lou Ruvo Center for Brain Health, will also be in attendance. The 154-pound division will take center stage on Saturday, May 21 in a stacked triple-header featuring three world title fights in the same division. Five of the division’s top-six fighters* will square off live on SHOWTIME from The Chelsea, a one-of-a-kind 40,000-square-foot venue, inside The Cosmopolitan of Las Vegas. In the main event, Cuban sensation Erislandy “The American Dream” Lara will defend his WBA Super Welterweight World Championship against U.S. Olympian and top contender, Vanes “The Nightmare” Martirosyan, in a rematch of their 2012 bout that ended in a technical draw. Brothers Jermall and Jermell Charlo will look to make history in co-featured bouts as the first twins to hold world titles in the same division. Unbeaten IBF Super Welterweight World Champion Jermall faces his toughest test to date when he makes the second defense of his belt against former world champion Austin “No Doubt” Trout. Jermell will take on exciting contender John Jackson in a bout for the vacant WBC Super Welterweight World Championship. The 25-year-old Charlos’ aim to make history against stiff opposition from a former champion in Trout, and the Olympian from the Virgin Islands in Jackson. One of the biggest fights of the year is scheduled to take place on May 7th live from Las Vegas, and BoxNation is partnering with icelolly.com to give a lucky winner a chance to attend Amir Khan’s big fight against Canelo Alvarez in Las Vegas. The contest will be for a four night stay to take in the big fight week to the famous strip. IBF #15 super-featherweight ranked contender, Mario Barrios, remained undefeated with a dominating unanimous decision victory over Edgar Gabejan (26-33-6, 9 KOs) a veteran of over 500 ronds, improving his record to (15-0, 8 KOs). Barrios, who hails from San Antonio, TX, came out guns blazing, dropping Gabejan in round one. Towering over his opponent, Barrios, who stands over six feet tall, used his height and reach to perfection as he landed precise punches throughout the remainder of the fight. Gabejan made it to the final bell but was severely beaten up. Scorecards read 80-71 across the board, all in favor of Barrios. This marks the first fight for Barrios in 2016. With the win, Barrios hope to get back in the ring as soon as possible. A world title fight by the end of the year is what Barrios has is mind set on. Keith “One Time” Thurman is scheduled to defend his welterweight championship against “Showtime” Shawn Porter at the Barclays Center in Brooklyn, New York on Saturday, June 25th. This bout will be broadcast by Premier Boxing Champions (PBC) and will be a Showtime Championship Boxing broadcast on CBS. The broadcast will begin with a co-main event featherweight battle between Jesus Cuellar against former three division world champion Abner Mares. Victor Ortiz is scheduled to face Andre Berto for a second time on Saturday, April 30th live on the Fox Network. This bout will take place at the StubHub Center in Carson, California. Ortiz recently held a media workout and below are a few select quotes from that workout. “I made a lot of mistakes that night but I did enough to get the victory. I always said if I ever got the rematch, I would end him and now I have the chance. “Berto had an off night. I wasn’t at my best either, but I destroyed him regardless. This time we’ll both be at our best. “Berto just talks and talks. When you have to hype yourself up just to think you have a chance, that’s on you. I don’t need to talk myself into thinking I’m going to win. I just know I’m going to win. “We’ve both had some wars since our first fight, but if you can’t back it up, you should just stop. “Berto comes to fight. He comes for war and won’t give up ever, but that makes two of us. “We have been through a lot in the last five years. He hates me. I have no hate in my heart, but I know it’s a sport. I’m not leaving that ring without a victory. “Berto wants to hurt me just as bad as I want to hurt him. I’m ready to go again. This is going to be a Fight of the Year for sure. “Anytime you have to convince yourself that you’re going to beat me. That you actually had a chance the first time, there’s a lot wrong with you. “It’s a sport. It’s not personal. Two guys going back and forth. I want to rip his head off and he wants to rip my head off. Its nothing personal. We can go get a burger after the fight. “He’s a heck of a fighter and a boxer and I am too. He’s had his fair share of wars. He’s had his fair share of injuries and I’ve had mine. “Coach Hoss has always been there 100 percent. He has been in my corner about a decade and he knows the game better than a lot of the people I’ve worked with. Every fighter needs to find a ‘zen’ with their coach and I have that with Coach Hoss. “I feel like this is the best fit for me. Hoss has been with me through it all, from being dropped, to the hospital and everything. He always says that this is just another way to make you stronger. “I also have coach David Rodela in my corner. We were once upon a time rivals and now we are closest of friends. It is a true ‘Grudge Match’ right there. Now he just tortures me in training. “At this point I have one focus. For the next three or four years I am going to be 100 percent focused on boxing. “I’ve had big celebrities and actors come up to me and say ‘you’re Victor Ortiz, can we take a picture?’ It’s mutual respect, but it’s also kind of crazy. I don’t overstep my boundaries. “I don’t watch the movie I’ve been in. That is too much. Some people like to see themselves on the screen, I’m not one of those people. “I believe that if you’re a bad person, bad things happen. I’m a hard worker. I used to work construction and out in the fields. I never complained. Always smiled. “I wake up in the morning with a smile on my face. People take some things too seriously. Of course there are haters out there, but I don’t pay attention to any of that. I’ve found that a good positive attitude goes a long way. “I’m ready to fight for a world title. Especially after this victory that’s coming. This is for personal satisfaction. Berto has been talking for five years and I’m ready to go. “I took a different route, a different approach. Why? Because I wanted to try other things. Do I have to be here? No. I turned down two movies to be here. Boxing is my first and true love.